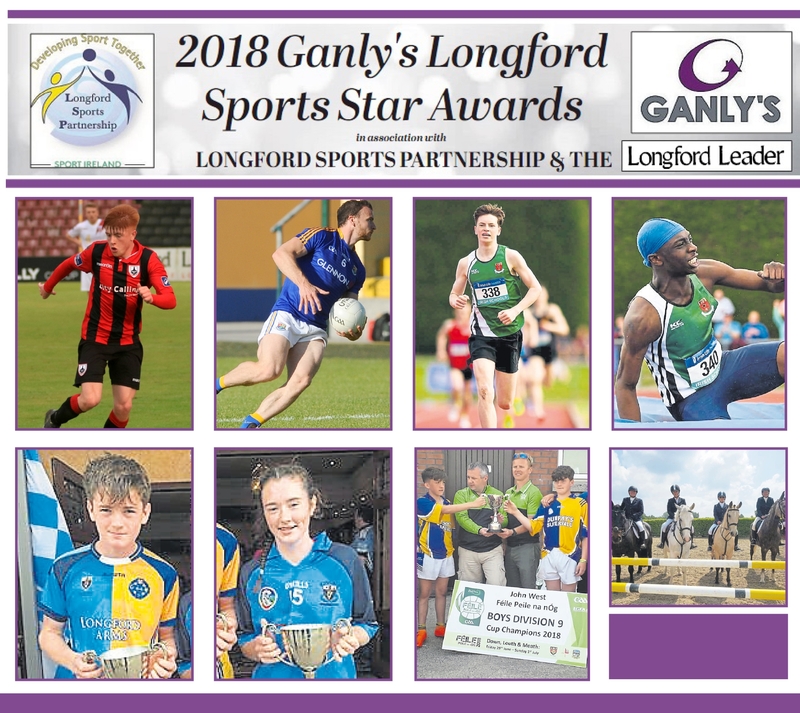 There are eight contenders for the 2018 Ganly’s Longford Sports Star of the Month Award for June, in association with Longford Sports Partnership and the Longford Leader. Voting closes at 9pm on Wednesday, October 10. For the first time this season Longford Town succeeded in beating one of the other main contenders for promotion in the Airtricity League First Division as they overcame Galway United 3-2 at City Calling Stadium. The Town were particularly impressive in the first half as they established a comfortable 2-0 lead and it was promising young local lad Aodh Dervin, a real joy to watch, who broke the deadlock in the 7th minute with a beautiful strike from just outside the box. Moyne Community School athlete Cian McPhillips added another National title to his long list of honours when he won the Intermediate (U-17) Boys 1,500m at the All-Ireland Schools Track & Field Championships in the Tullamore Harriers Stadium. With 400m to go he literally exploded into life and covered the next 300m to decimate a field of talented athletes in producing an outstanding performance to claim the Gold medal. Nelvin Appiah made it a memorable day for Moyne Community School when soaring to glory in the Intermediate (U-17) Boys High Jump at the All-Ireland Schools Track & Field Championships in the Tullamore Harriers Stadium. In the process of winning the Gold medal the highly talented Longford athlete set a new championship record of 2.02m, much to the delight of the crowd of spectators who began to build in the expectation that something special was about to happen. Inspired by the outstanding captain Donal McElligott who was a real driving force at centre-half-back, Longford almost caused another notable upset when running Kildare so close in Round 2 of the All-Ireland SFC Qualifiers. Denis Connerton’s courageous side were never headed until the 69th minute and were eventually beaten by three points, 1-16 to 1-13, in the tension packed finish at Glennon Brothers Pearse Park. Adam Murray will remember June 2018 for many years to come as he had the honour of captaining the Longford Slashers U-14 hurling side that captured the John West Féile na nGael Division 9 title with a 0-7 to 0-3 victory over North Wicklow Gaels in the final at Pairc Sean Mac Diarmada. A week after that June 16 triumph, he finished in the top 10 in the country in the Féile na nGael Skills Star competition at Abbotstown. Three weeks later, despite still being U-14, he represented Longford at the Leinster U-16 Poc Fada and finished 7th. This year is the tenth anniversary of the formation of Longford Slashers Camogie Club and fittingly, they marked the milestone in wonderful fashion as their U-14 side won the John West Féile na nGael Division 7 camogie crown. The all conquering squad was captained by the talented Melissa O'Kane and in the final, Longford Slashers overcame Tara Rocks (Wexford) by 2-3 to 0-3. Longford Slashers played host to San Francisco in hurling and to St Eunan's, Letterkenny (Donegal) in camogie as Féile na nGael came to the county for the first time. In 2017, Melissa, who plays ladies football with Ardagh St Brigid’s, won the U-14 All-Ireland Féile Peil na nÓg Ladies Skills competition. Mosstown Riding Club, based at Mosstown Stables in Kenagh, won the prestigious TRI Equestrian Team Show Jumping Challenge at the 2018 AIRC Festival in Mullingar Equestrian Centre in June.The festival is a national event, organised by the Association of Irish Riding Clubs (AIRC), and it includes show jumping, dressage, showing, working hunter, musical rides, fancy dress pairs and is held over two days. In show jumping, Mosstown won the Advanced Primary Show Jumping Team (Emer O'Donnell, Annmarie Doyle Harbourne, Ruth Harrison and Sue Moles, pictured here) competition and they also won the Advanced Intermediate Show Jumping Team competition (Leslie Fitzgerald, Kelly Fitzgerald, Aine McLoughlin and Eilis McLoughlin). Granard/Ballymore U-14s won a National Féile Peil na nÓg title for the first time ever at the end of June when they defeated Curry of Sligo by the minimum margin, 0-4 to 0-3, in a nail biting Division 9 Final. The joint captains of the victorious squad were Padraig Boyle and Jamie Brady (pictured). Back in 1994, St Mary’s won a Féile Peil na nÓg trophy and this was the first time the amalgamated side were triumphant on the national stage. Granard/Ballymore were hosted by the Ardglass club in Co. Down over the course of their successful weekend. In the quarter-final, Granard/Ballymore accounted for Fenagh of Leitrim by 1-10 to 1-2 and in the semi-final they defeated De La Salle (Waterford) by 3-6 to 4-2 after extra time.